Obama claimed that Wright was mistaken because he was angry, distorted reality, and "spoke as if society was static." Part of Obama's comments resonated with me: "That anger is not always productive...[it] prevents the African-American community from forging the alliances it needs to bring about real change." I've seen that anger, not just in Rev. Wright or other African-American preachers, but in conservative and liberal white preachers, and in people. 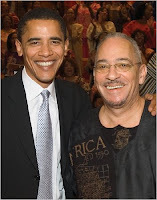 My critique of Obama's comments does not mean that I support or reject Rev. Wright's comments. But I do understand Wright's remarks and I believe the anger behind them is legitimate. I will return later to the prophetic nature of his comments and their tactfulness and appropriateness. For now, the lingering question in my mind is this: Is what we say and do grounded in love?